Compared with a typical battery, golf cart batteries are designed for deep cycles and are often found with 6, 8 and 12-volt sizes, which is ideal for an electric golf cart. The best golf cart battery is the Trojan 6 Volt Battery T-105, which has specifically designed deep-cycle cells that do not degrade from frequent discharges. A golf cart battery is not the most exciting product to buy but if you have an electric golf trolley, it is an essential part. A faulty battery can leave you stranded whilst you are halfway around the golf course, which can be a real pain. 7.9 What Features Should You Look For? 7.10 How To Test The Golf Club Battery? 7.11 How To Clean The Batteries? Before taking the plunge and purchasing an expensive golf cart battery, you will need to check the voltage and capacity required. More powerful electric carts require the additional power in order to perform as it should. Key features you should ensure are present with a new golf cart battery are an enhanced battery life, designed for long cycles with continuous discharges and robust construction for the bumpy golf course. The majority of cart batteries are a flooded lead-acid battery or AGM lead type where both are very reliable and often come with warranties as peace of mind. Below is a list of the best golf cart batteries to power up your electric trolleys on hilly courses. 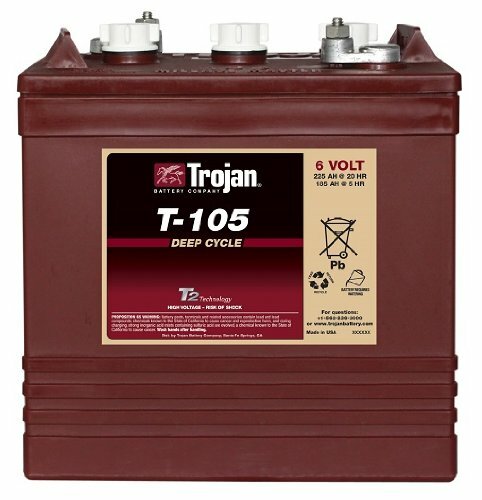 The T-105, a flooded lead-acid battery by Trojan is viewed as the best in the business for golf cart use. It is a tough and reliable premium battery as well as featuring the Trojan’s fibreglass separator design and unique paste formula. Trojan ensures excellent quality through their almost 200 inspection points before the product is evenly distributed. Their plates are 30% thicker than those of competing brands, which further proves their long lasting ability and durability. The Rate of Discharge: 447 mins at 25 amps to 115 mins at 75 amps. It is a reliable and clean power source for anything mobile, including marine, RVs, electric vehicles, and golf carts. It features T2 Technology, which is historically proven through Trojan’s products to provide for maximum performance, energy, and life. These batteries can have up to 1200 cycles at 50% DOD, while at 80% DOD, they can have at least 800 cycles. Though the battery is quite heavy at roughly 62 lbs., it makes that up by offering enough battery juice and power to keep your cart running. If you use it at 25 amps per minute, it can last you around seven hours. Overall, it is the best battery for golf carts and will be an excellent power source for years to come. 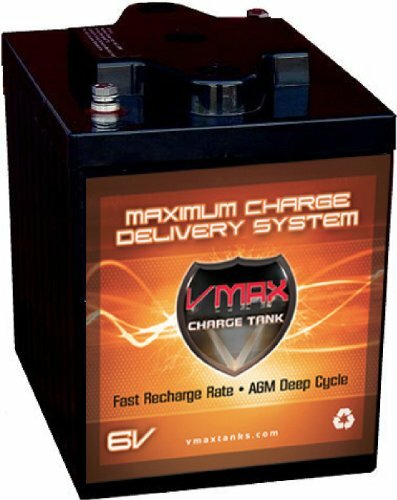 If you’re looking for a battery that will provide you with plenty of power but will not involve copious amounts of maintenance, then this VMAXTANKS 6 volt battery will be the perfect choice for you. It avoids you having to add water or checking the gravity reading, making it truly maintenance free. With proper care, the battery should last you anywhere from eight to ten years. Capacity: 225Ah at 20 hours. This battery is truly a onetime investment for multi-purpose usage. It is technologically advanced, durable and heavy-duty, thus being perfect for all your golf cart functions. The design is based on an electrolyte suspension system, therefore, is free of silica or any type of contamination. These batteries are high performance-centric and are recommended by field experts. As they are completely maintenance free, they can be charged and discharged multiple times. The lead-tin alloy provides extra performance margins to allow them to work perfectly on cyclic or float applications. 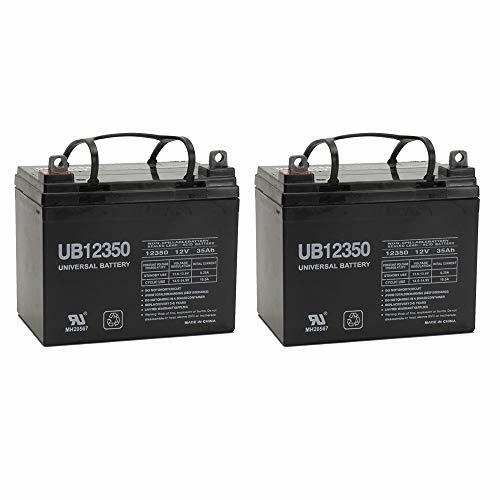 The UB12350 battery by Universal Power Group is one of the best lead-acid batteries currently on the market. If you’ve got a high tech golf cart, then this pair of batteries is the perfect complementing battery. They are made by a reputable manufacturing house, which means that you can be assured of the quality that they come in. They are also very portable and lightweight to offer you cart with the best functionality and longevity. Dimensions: 7.68 inches x 7.13 inches x 5.16 inches. These batteries feature an absorptive glass mat technology, therefore, allowing them to be used for various purposes aside from golf carts, such as solar arrays. They are also one of the most economical options available due to being loaded with the latest tech. As they come in a pack of two, they provide you with a hassle-free battery that has a lifespan of three to five years. This battery by UPG can be used in a variety of ways, including exit lighting, flashlights, spotlights, UPS backup systems, and more. They meet the strictest quality control standards set by UPG. They are made to hold up to the spill-proof standards set by the Department of Transportation and is set in a fixed fibreglass mat that uses non-corrosive materials with an electrolyte. Thus, meaning that any sized golf carts can use this battery. Overall, they are the best cheap golf cart battery and considering there are two, it is easy to charge one whilst using other for convenience. Unlike many other batteries, this GC2 6V AGM Golf Cart Battery by Amstron is completely maintenance free. This battery is not only limited to golf carts, as it can be used on wind motors, solar motors as well as other house motors. They are designed to deliver your golf cart with a long backup at a lower price. These batteries feature absorbed glass mat technology which allows there to be no free liquid in the battery. Thus, there won’t be any generation of heat during the cycles allowing the battery to charge quick and discharge a slower and steadier pace. The absence of liquid also ensures that there will not be any concern about freezing. The battery also helps by having the lowest possible hydrogen emission at only 4%. At a twenty hour rate, it features a 210 AH capacity. 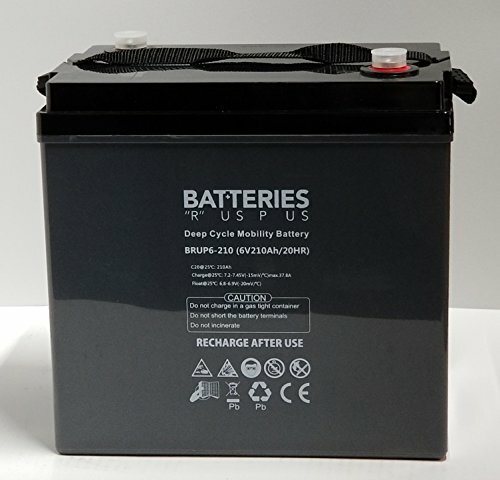 This battery comes recommended because of its price versus quality ratio as well as the amount of battery juice that it comes with to keep your golf cart going for as long as possible. 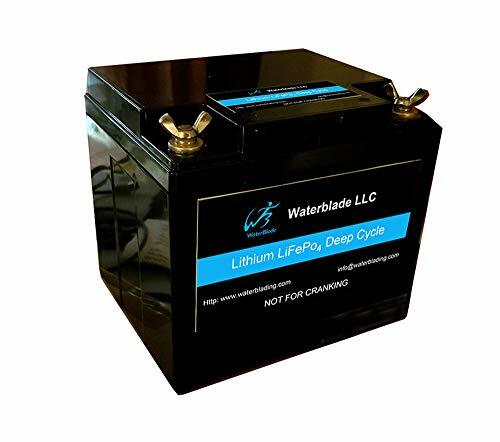 There are not that many golf cart lithium iron-based batteries, but this WaterBlade alternative is one of the best in the market. One of the best things about lithium iron-based batteries is their weight, which is very low in comparison to its SLA counterparts. Though the weight is low, it still gives a 50Ah capacity. The continuous maximum discharge current reaches around 70A. Many owners love the weight of the battery even if it has less capacity than its counterparts. However, this battery allows you to have a continuous power allowing you to go for longer while not skimping on your safety. If you’re on a search for the best golf cart batteries, you know it can be quite time-consuming and scary due to the sheer number of products and specifications that need to be looked at. Nowadays, batteries for golf carts do last longer, therefore allowing you to get the highest quality product. As golf carts are a great investment to your golf game, they need to have high-quality batteries to run as efficiently as possible. Golf cart batteries look similar to car batteries, but they are smaller and traditionally require quite a bit of maintenance. The more modern golf cart batteries are almost all the way maintenance free. While they might all look the same or similar, they do have their advantages and disadvantages, all of which we’ll be going through within our reviews. Just the same as any other product, batteries for golf cart also come in a range of various voltage sizes. The voltage of a battery refers to the force that is used to create an electric current, which in turn gives strength to the battery. For specific golf cart purposes, batteries usually come in 6 volts, 8 volts, and 12 volts. 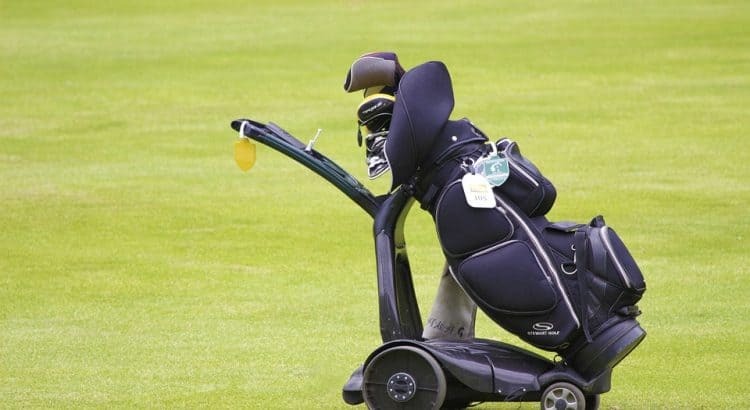 The majority of golf cart owners go for the 6-volt batteries as they allow them with the highest amount of versatility as they can be connected together to achieve the voltage that is desired. Though many of the batteries might look the same on the outside, they are not all made equal. There are features that some have that others might not have. Depending on what you’re looking for, you need to keep some considerations in mind to help you find your ideal battery. When choosing the right battery for your golf cart needs, it’s important to know which voltage is the ideal choice. As mentioned before, golf cart batteries often come in 6 volts, 8 volts, and 12 volts. If your system requires a 48-volt system, you can either have four 12- volt batteries, six 8 volt batteries, or eight 6-volt batteries. There are various different capacities that batteries might have. The capacity of a battery refers to the amount of power that the battery is capable of holding and supplying. The lower the capacity is, the less time you’ll have until it runs out of battery. It is measured in amp hours, also written as AH. The best option is for you to get higher capacity batteries so you are able to drive for longer without needing a recharge. It is also possible to increase the capacity of a battery by joining multiple of them together. For this, you’ll need to ensure that the battery is compatible with creating a parallel connection. There are three main types of golf cart batteries on the market today, those being AGM Lead Acid Batteries, Gel Lead Acid Batteries, and Flooded Lead Acid Batteries. Though they are all great and have their advantages, they are all different, which means that some of them might not suit your needs. These batteries are relatively new to the market. They use a fiberglass separator to keep the electrolytes in place. These are considered to be some of the most robust batteries as they hold up well to any impacts, vibration resistant, and spill proof. These batteries use a thickening agent to keep electrolytes in place. They are not easily moved. However, they are very sturdy so even if the battery gets damaged, they can still run smoothly. These are the most common batteries currently on the market. They are versatile in use and design as they are not sealed and come in a range of sizes. This means that if you lose any electrolytes, they can easily be replenished. Regardless of whether you use lithium-ion batteries or lead-acid batteries, they have to be charged, which takes time. If it takes a long time for the batteries to charge, you’ll be out of the game for a while, unless you have a second cart at your disposal. It’s important for golf carts to maintain consistent speed and power on any terrain. Lithium-ion batteries are able to manage this without any problems, but lead-acid batteries can slow down if the voltage drops. After the charge has completely dissipated, it can take lead acid batteries roughly around eight hours to fully charge. However, lithium-ion batteries are able to charge 80% in less than an hour. A battery should only be made six months prior from when you purchased it. This can be determined from the sticker that lets you know when it was made. It is often found with the manufacturing code or the top right side of the battery. It’s first important to determine what type of cables you’ll be using. With that, you can then see which terminal option would be the best to meet the energy needs. You will need to look at the number of terminals with the chosen battery and purchase cables that correlate to ensure that they are the right size. This will also help to avoid overheating. The build of a battery should correlate with your riding style. Golf cart faces limited speeds, but the batteries can get damaged through rides over rough terrain. So, if you can see yourself going into rough terrain frequently, then try to find batteries that have rugged sides to protect them from cracks. It is also worthwhile to invest in batteries that are protected against electrical shortages. As with anything else, batteries do not generally have an infinite life. After a certain number of cycles, it is expected that we will need to replace them. With golf cart batteries, the number of cycles refers to the charge and discharge cycles. Every time you recharge the battery, it diminishes the battery little by little. The majority of batteries on the market today offer somewhere around 700 to 1,500 cycles. Through your researching, you’re bound to have come across certain keywords or phrases that you did not fully understand. Below, we’ve listed some of the key features that you should look out for within the product description and reviews. Deep Cycle Service – A high density, thicker lead plates along with a reinforced grip allows the battery to have longer cycles to continuous recharging. Less Maintenance – Featuring a maintenance-free or low maintenance design that features large tank for optimized water consumption and reduced water loss, as well as heavy-duty sheet separators. The heavy-duty casing also it to last with all elements and increases longevity. Life – Batteries that have good cycling technology that allows cycles between 800 to 1500 cycles of discharge. The more cycles and better depth means enhanced battery life. Vibration Resistance – Features connectors that are fitted with cast-on’s enable higher electrical conductivity, therefore, result in superior strength to resist vibration while driving. Control and Power Distribution – with an optimized design in which the stream is aligned with the current flow path you can guarantee the highest amount of power. Robust Construction – if the design uses high-density components, then you will ensure the longevity and protect against any electrical shortage. How To Test The Golf Club Battery? It can sometimes be a gut feeling when your battery isn’t good anymore. But before you throw it out, you want to be 100% sure, so you know you’re not wasting money. There are a few ways to check to make sure that it’s either still working or its time for it to be replaced. Use A Load Tester – This is one of the quickest ways to test the batteries. The load tester is a voltmeter that is connected to a simple DC heating coil. All you have to do is connect the load tester to the battery and the device will display the battery’s voltage. If the battery has dropped more than .5V, then it’s very likely that the battery is starting to fail. Use A Hydrometer – Though many might not have this, if you are one of the few, then it’s another way to find out the health of your battery. It is not as easy to use as a load tester. If you have not used a hydrometer before, it is recommended that you simply take the battery to an expert to find out. How To Clean The Batteries? One of the best ways to have longer lasting batteries is to properly maintain them. Now, most of the ones we’ve listed have been maintenance free, but if you feel like cleaning them there are a few things that you can do. Aside from the cleaning directions that come with the battery from the manufacturers, below are a few steps to follow. Purchase protective clothing – This should be the first step because batteries are filled with acids. If they are exposed to any part of your body, it could cause serious health complications. Have running water nearby – The water will be handy if the battery acid splashes on you as it can help neutralize the acidity. Additionally, you’ll need water to mix. Get water and baking soda – Simply mix some water and baking soda together and spray it on the battery. If necessary, use a paintbrush to brush off any dirt. It the dirt does not come off the battery, spray the mixture onto the battery and leave for a few minutes before brushing off. Using an unreliable and weak battery to power your electric golf cart can be a real pain. The possibility of being left stranded halfway around the golf course because your battery has broken is something that should kick-start your search for a new golf cart battery. The Trojan and VMAX are the most top rated golf cart batteries with excellent specifications and not many drawbacks. Golf cart batteries are not the most fun thing to invest in but if you do, these two batteries are the ones to go for.